Welcome to the how legends are made show!! Chasing your Dreams…. Legendary People understand the rules to reaching their dreams. Hard work is one thing, commitment another, and it’s the intangibles that help people become legendary. 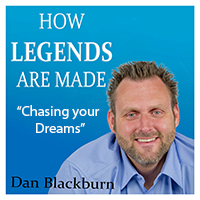 In this episode, you will learn the 3 keys to reaching your dreams and living a legendary life. When you believe in YOU as much as you want others believe in YOU, success will find you!! !